Recently I’ve been aware of several people around me who have been searching for specific answers to their prayers and dreams. They have focused intently on their hearts desires, looking steadfastly for the answer. As each day passes and their answer fails to come, they sometimes succumb to those feelings of loss, defeat, or despair. My message today is to these people, and any of you who may be in a similar circumstance. 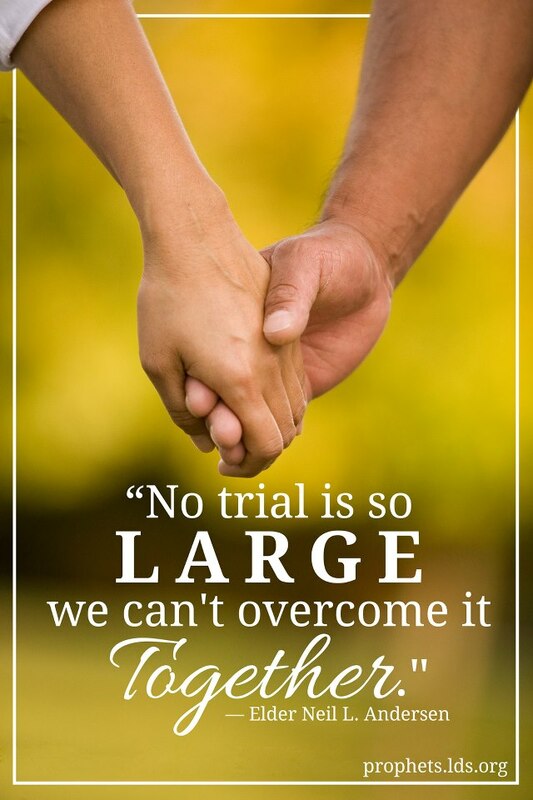 As each trial in our marriage presented itself, Ashley and I looked for ways to overcome them. Some were easier than others, and some took incredible amounts of time to overcome. I found that as we focused together on the trial, and put our faith together in finding the answer, we always saw a stream of light enter our presence. Most of the answers we were looking for never came in the time we wanted or even necessarily in the way we wanted, but they came. Life is such a wonder to me. Every day, I find myself pondering some new thought, trying to figure out the meaning of all that is around me. I know ill never truly understand everything in this life, but some of the fun I’ve had has been understanding some things as the days go by. Life loves to throw curve balls at us. Just when we think we have things figured out, the bank account balanced, our homework done, and the kids all cleaned up for dinner, life gifts us those little surprises. Some are good, and some are bad, but all teach us something. I’ve found that over my 35 years of life, most of that time I never spent learning the lessons that were being taught. As I slowly began to understand that the events in my life had something to teach me, my eyes were opened, and my mind enlightened. Trials will always come. They never end. I’ve come to realize this as a truth. I’ve also come to know that my reaction to those trials makes all the difference in life, especially to those closest to me. As we are faced with life’s trials, I think it is wise to understand first, they have some thing to teach us. Second, they give us an opportunity to help and teach others. Using just one example from a struggle both Ashley and I shared, our infertility, we were not only able to learn from this hardship and overcome our trial, but also to have empathy and understanding for others struggling. As we have moved on from that trial, many have not. We find it a joy to help those who are still struggling with that trial, and in some sense gain a great satisfaction from the results we see. I guess a lot of my message today has to do with our outlook. 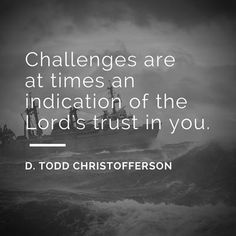 If we know the trials are going to come, we can prepare for them. We will never be fully prepared, but that is where the learning aspect comes in. As we build upon our education, our strengths, our emotions, our empathy, our faith, our physical endurance, our love and our compassion, we begin to better ourselves to overcome our own trials, and prepare us to help others in need. Trials are a funny thing. For me, at first they were always about me. Over time, I’ve come to find out, they in fact affect every person around me. Isn’t that ironic? 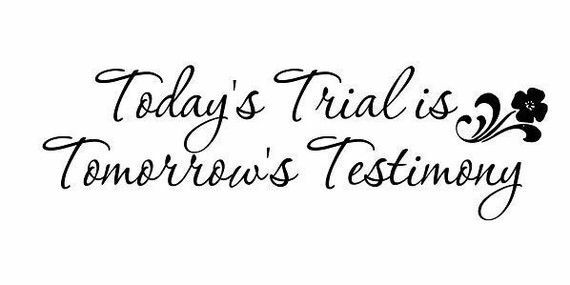 As today continues on, you may or may not be facing a trial. You may be at your lowest point, or may be having the greatest day yet! 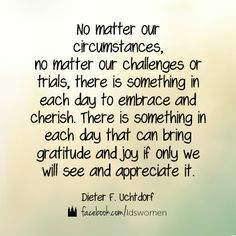 Remember that through our experiences and trials, we gain something. Something that can be very beneficial not only to ourselves, but to others. If you are struggling today, its ok. Don’t lose faith. Never give up hope that your hearts desires will be met. Look for the ways you can learn and grow from what you are experiencing today. I promise you the good Lord above has a plan for each and every one of you, and anything you are facing today, will teach you something that your will use tomorrow. Those of you that have been through hell, look out your windows. Look at your neighbor. Look at your brother or sister. You may have something to offer that they need. Your understanding of a trial could be exactly what they need right now. People rarely come out and tell you exactly what they are facing and what they need. You have to be sensitive and be able to read their emotions and words. I promise any trial you have gone through, can benefit someone else. The God in the heavens has a plan that is perfect for each and every one of us. On the flip side, we are all a part of his plan, together. Remember that life isn’t always about YOU, but YOU are always a part of life. Keep your heads up. Help others keep their heads up. Look out for one another. I hope you all have an incredible weekend! I love you all!